We are thrilled to announce here at Maree Pigdon Sewing Centre we have now reached and exceeded (it’s growing everyday!) 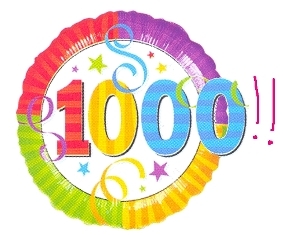 to 1,000+ subscribers!! So a very warm welcome to all our new subscribers! Also for those who have been on my list for quite some time now I have exciting news for you too! As you know part of your subscription is that you receive a whole year of weekly sewing tips to help you with your sewing. That’s 52 tips! As it turns out we have had so many subscribers email to say they miss their weekly sewing tip after they pass No.52! Simply email me at: maree@mareepigdon.com with your sewing tip, your name and where you are from for your chance to appear! We look forward to receiving your sewing tip soon! Thanks for being a subscriber at Maree Pigdon Sewing Centre! Please leave me a comment below too, I would love to hear about your latest sewing project and what you have to say about our sewing tips!